Joe Tennis, Bristol Herald Courier, Va.
Marlene, the middle-aged woman who's been cutting my hair for years, told me she had just gotten a prognosis: She has osteoporosis. This might have been expected. She's never been a milk drinker. And not drinking much milk, she figured, did not help her bones, as she needed that milk for calcium. Turns out, Marlene is not alone. One out of every two women and one in every four men -- age 50 or older, like Marlene -- will have a fracture caused by osteoporosis, according to Kenneth J. Little, Jr., the executive administrator of the Marion, Va.-based National Osteoporosis Awareness Health (NOAH) Project/Health Projects USA. "It's a silent epidemic," said Little, 64. "There are no symptoms, until a fracture happens." Marlene had found her problems with a scan at a hospital. For her, fortunately, her health insurance picked up the tab. Others may not be so lucky -- in riches or in health. In the United States, 12 million people have osteoporosis, and 40 million more have Low Bone Mass, making them at risk of a fracture, Little said. Yet a simple 10-second X-Ray of the finger can help determine one's risk of a fracture, and improving one's nutrition can also prevent and/or treat osteoporosis. Osteoporosis can affect everyone, age 20 to 70, of all ethnicities, and both genders. "It is a universal disease," Little said. Little's motto: "Invest in your bones -- Early detection is your best protection." Get more calcium, said Little. Good sources are milk, cheese, yogurt, broccoli, kale, spinach, orange juice and breakfast cereals. "The whole bottom line of this thing is (bone density) can be easily maintained and improved through better nutrition," Little said. Little's non-profit group, the NOAH Project, began more than 20 years ago in Las Vegas and moved to Marion, Va., in 2008. NOAH provides simple X-rays at a low cost -- usually about $25 a screening, as opposed to about $90 a screening at doctor's offices -- onsite at any venue that has electricity, Little said. "We have provided over 25,000 screenings," Little said. 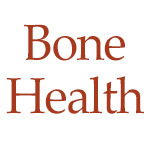 "Our goal is to provide a bone-mineral-density screening to every person in the United States, both male and female, age 20 and over, to give them at least a baseline and an appreciation of what they need to do to maintain good bone health."